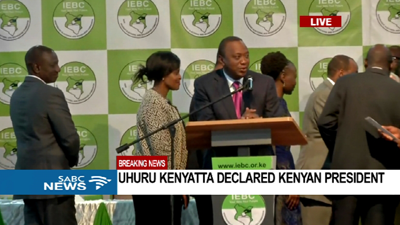 Kenya's Uhuru Kenyatta wins second term with 54.27%: official - SABC News - Breaking news, special reports, world, business, sport coverage of all South African current events. Africa's news leader. Kenya’s President Uhuru Kenyatta has been declared the winner of Kenya’s disputed election with 54.27 percent of the votes, beating his rival Raila Odinga who scored 44.74 percent, the election commission announced. “Having fulfilled the requirement by law… I therefore wish to declare Uhuru Kenyatta… as president elect,” said polls commission chairperson Wafula Chebukati, as cheers and singing broke out at the national tallying centre. Earlier Kenya’s opposition coalition, the National Super Alliance (NASA) refused to endorse presidential election results putting President Uhuru Kenyatta in the lead against Raila Odinga. NASA’s chief agent James Orengo said the electoral commission did not agree to its demand to be allowed access to IEBC system commission’s server. Orengo insisted that the results were slanted to favour President Uhuru Kenyatta. The opposition coalition, led by Kenyatta’s rival candidate, Raila Odinga, rejected the announcement of the results in advance. The opposition, who claimed earlier that the electoral commission’s computer system had been hacked, said it will accept the results only if it is allowed access to the raw data behind the results. This entry was posted on 11 Aug 2017,09:33PM at 9:33 PM and is filed under Africa. You can follow any responses to this entry through the RSS 2.0 feed. You can leave a response, or trackback from your own site.